Crime doesn't pay. If you end up breaking the law you just might find yourself in a jail cell with a new best friend, the ball and chain. This new friend of yours will go wherever you go and just be a heavy weight you'll have to carry around. It may seem archaic, but the ball and chain is no laughing matter. Well, maybe it is until you find yourself attached to one for an indefinite amount of time. And not only will you have to drag the weight around the prison yard, but odds are you’ll be hauling it while you work all day in the hot sun with the chain gang. Now you can get the classic look of a prisoner in jail with this great criminal accessory without actually having to go to jail. 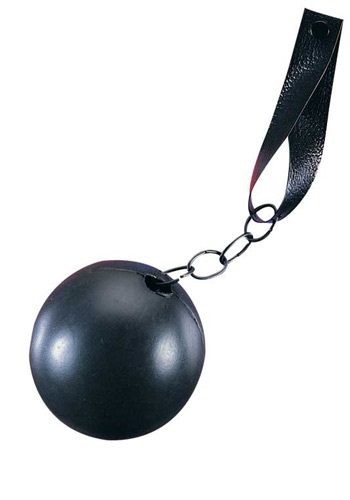 This plastic ball and chain accessory doesn’t weigh a metric ton, either. Carry it around all night long this Halloween. The plastic ball and chain are attached to a faux leather band that attaches easily to your ankle for an authentic look straight out of the big house! it's good for 3.00 dollars /Cost friendly! Using it in a play... but fit the cast member well. This was a cheaply made item. Probably could have lasted longer if we were more careful. The material by the snap completely ripped. Great for my husband to wear!